The M-Class was the first mainstream SUV from Mercedes-Benz. Now in its third generation, the M-Class is primarily a road-oriented SUV with car-like ride and handling. Competitors in this segment include the BMW X5, Infiniti FX, Cadillac SRX, Porsche Cayenne, and Lincoln MKX. 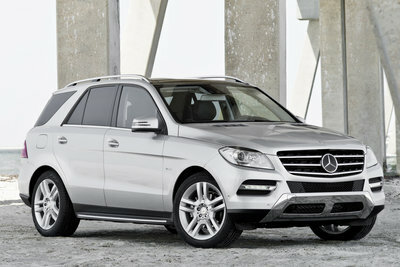 Mercedes-Benz offers the base ML350 with a 3.5L V-6 rated at 302-bhp. A standard 7-speed automatic is optimized for maximum fuel economy. Buyers looking to further improve their fuel economy can opt for the ML350 BLUETEC diesel model which is rated at 20 MPG City, 27 MPG Highway. The M-Class is also offered with two different V8 engines. The ML550 equips a 4.7l V8 rated at 402-bhp, whereas the AMG performance model of the series equips a 518-bhp hand built 5.5l V8. Pricing starts at about $50,000 and does not include leather upholstery. The M-Class adds a rear-wheel-drive ML350 model. An updated telematics system becomes standard equipment.